Malborne Under 12s are pictured before their 6-0 win against Gunthorpe Harriers Navy - a result which earned them the Division Four title. From the left are, back, Paul Ambler, Dylan Glendenning, Dylan Ilett, Matt Driscoll, Jake Soley-Cripps, Harry Benstead, Luke Rymill, Samuel Hodgson , Patrick Dooner, front, Lewis Driscoll, Luca Ambler, Max McLaughlin, Josh Howard, Aidan Palmer and Alex Driscoll. Malborne United Under 12s got their hands on one trophy last weekend and hope to move closer to another this weekend (March 19). 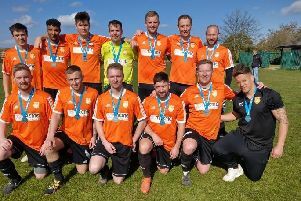 The city side were only formed 10 months ago but on Sunday they clinched the Division Four title with a game to spare. And they did it in style, beating Gunthorpe Harriers Navy 6-0 to preserve their unbeaten record in league matches. Luke Rymill (2), Samuel Hodgson (2) and Lewis Driscoll (2) shared the goals, which took the team tally to an impressive 141 from 15 matches. This weekend they are in Northants County Cup semi-final action away to Buckden. Manager Patrick Dooner said: “I’m really proud of all the lads. They have always given me everything in every game even when playing in positions they are not comfortable with. “Each lad is a credit to their parents and should be very proud of themselves.